A group of approximately 15 endangered Bolivian river dolphins were trapped in a lake. ST. LOUIS – Veterinarians from the Saint Louis Zoo joined veterinarians from the Maryland Zoo to rescue dolphins in central Bolivia. The team traveled 4,000 miles. 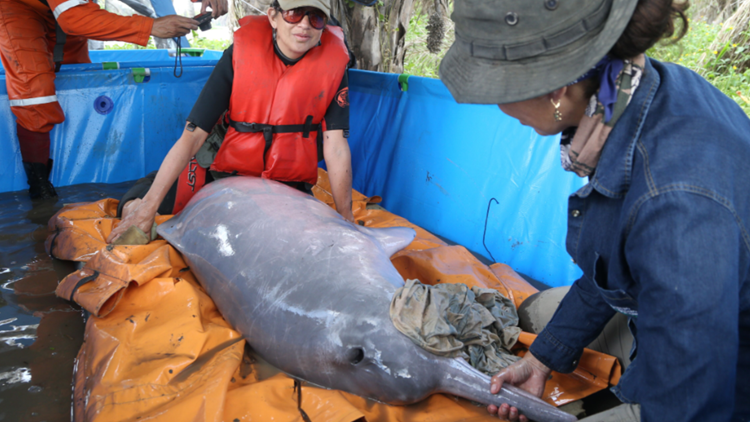 A group of approximately 15 endangered Bolivian river dolphins were trapped in a lake. According to the Maryland Zoo, the dolphins were isolated in the lake surrounded by dense forest and expansive soybean fields and had become cut off from the main river over the past several years. "This species is endemic to Bolivia," said Dr. Ellen Bronson, senior director of animal health, conservation, and research at The Maryland Zoo. "They face many threats in the wild mostly due to the conversion of forest into soybean fields, which leads to erosion of dirt into rivers, along with potential contaminants and diseases. They are very secretive, and little is known about their biology and health, including how these environmental changes affect their survival." A grant from the American Association of Zoo Veterinarians' Wild Animal Health Fund made the trip possible. The zoo said the challenge for the group was to find a way to reach the dolphins and then a way to transport them to a river release point. 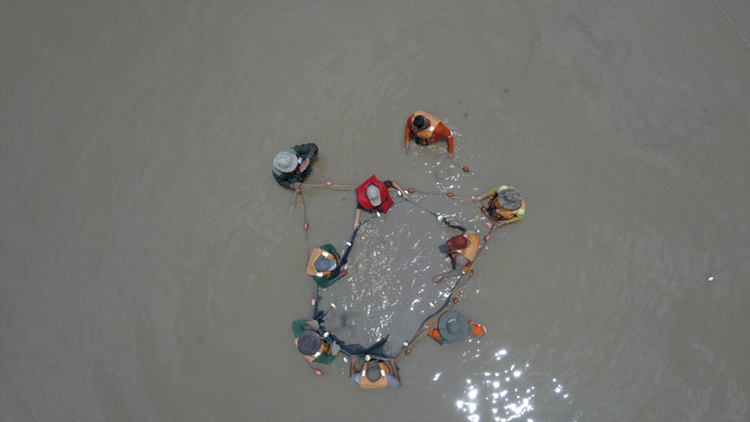 Battling knee-deep mud, mosquitoes, extreme heat and rudimentary roads cleared by machete, the group worked with regional aquatic rescue experts and forest fire fighters to reach the lake. Once there, the dolphins' natural curiosity and the team's extensive planning helped to quickly and safely guide the dolphins into transfer nets. A full medical examination, including blood samples, an ultrasound examination and swab collection for culture and parasites, among other testing, was completed prior to loading each dolphin into the back of a specially rigged pick-up truck. Before release into the river, three of the dolphins received satellite transmitters connected to their dorsal fins, which is providing real-time information about their locations, movements, and survival. Transport from the lake to the river took nearly two hours, and the dolphins were monitored closely the entire time. During their two weeks at the lake, the group relocated six dolphins and collected priceless information on the species. "We believe that these were the first full health examinations done on this species with extensive diagnostic sampling. There have been research studies on this species in other areas of Bolivia, and they have also taken some limited samples, but not to this extent," said Bronson. Results from many of the tests were recently received and could greatly impact future conservation efforts for the species. "The six dolphins, one female and five males, including one juvenile, were in surprisingly good condition and overall appeared healthy on examination and on initial laboratory testing," said Bronson. "Having the opportunity to work hands-on with this amazing species and contribute to its conservation was a very gratifying and humbling experience."